Look, I’m not going to lie, I feel like we really missed out on the quintessential English experience. It didn’t rain. Not even once. There was sunshine. There was frost. Heck, there was even snow, but no rain. What a sham! But not a shame ‘cause the weather was delightful, if not slightly freezing cold. Snuggled in our chic AirBNB apartment in Westminster, we woke to a white London, sprinkled with fluffy snow. It wasn’t enough to be an inconvenience (that storm came later that night), but instead added a layer of magic to our first London encounter. With a bounce in our step, we navigated the photogenic streets in search of, you guessed it, good coffee. We found just that at local cafe, Iris and June, which served a delicious cappuccino and fantastic brekky. Thank you, London. With full bellies and another cappuccino to-go warming our hands, we happily spent the rest of the morning getting lost in the streets of Westminster. My goodness, I don’t think I’d ever seen buildings so classically beautiful. We agreed enthusiastically that we were in a blogger’s heaven for you could literally shoot your daily outfit on any corner of any street here. Oh, the things we think about. Is it far too cheesy that I wore red, plaid and a trench coat in London? 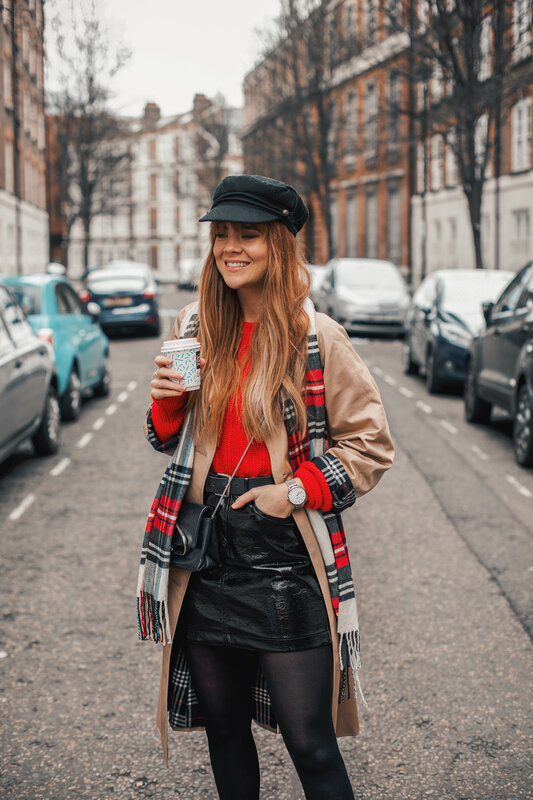 Not usually one for clichés, I actually really like this stereotypical British combination of styles, colours and prints, along with my go-to baker boy hat, mini skirt and chunky boots. I agree with you though, if the coffee was English Breakfast tea, I’d have gone too far. Marks & Spencer trench coat, Rebecca Minkoff knitted jumper (old – similar here), Glassons faux leather mini skirt, ASOS baker boy cap and tights, plaid scarf, CLUSE silver watch, 3.1 Phillip Lim bag and Andy Csinger x Walnut Melbourne boots from The Iconic.